Best Decaf Coffee – Cup of java, cup of joe or just a regular cuppa – whatever your terminology, we do love a good cup of coffee in the morning. Whether it’s for that initial boost to get you up and raring to go, or the comfort factor that’s especially welcome on those dark, winter mornings or maybe just the fact it tastes great; coffee has become such a popular part of modern culture. And consequently, engrained as part of our health-conscious society, a large proportion of coffee-based discussion is dedicated to the debate on whether or not it’s really good for you. A quick scan of google will prove that so much research has been done into the health-promoting ingredients found in coffee such as the ever popular antioxidants, which fight not only to keep us acting but also looking younger too! Coffee is said to reduce the risk of heart disease and Type 2 Diabetes, so all that being said, what’s the deal with decaf? Decaf refers to the term decaffeinated – which simply means the removal of caffeine from products such as coffee, tea leaves, cocoa etc. Products such as soft drinks, which do not contain caffeine can sometimes be referred to as decaffeinated, however, it’s probably more accurate to say non-caffeinated, because the implication, when using the term ‘decaf’ or decaffeinated, is that they did at one time contain caffeine. That being said, decaffeinated drinks typically still contain 1-2% caffeine, which can vary to as much as 20%. 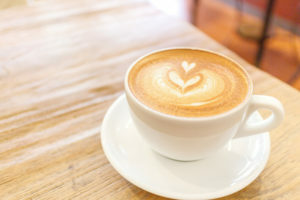 Healthy – as mentioned before, while regular coffee does contain antioxidants as well as other positive ingredients, its decaf alternative means that you don’t experience some of the more unwanted side effects but it still retains those elements, which promote defence against serious diseases and medical conditions. No Unwanted Headaches – the addictive element of caffeine can mean that drinking large amounts and then conversely not consistently drinking the same amount produces headaches, which of course you avoid with decaf. Sleep well! – caffeinated coffee triggers an increase in heart rate, which can cause people to experience nervousness, ‘jitters’ and insomnia; both of which are averted with decaf, so you can sleep like a baby! Ground coffee is the state that coffee is found after being broken down into granular form and saturated with water. Blade grinders tend to be less expensive but then as you can imagine would be the case, the quality is up to scratch producing an uneven grind, which is often followed by a bitter taste. Burr on the other hand, produce a better quality grind and, therefore, a better tasting cup of coffee! And that’s about all you will need to know, so let’s check out what’s on offer! Coined Italy’s favourite coffee! This Lavazza Decaf Espresso Ground Coffee includes a good amount of coffee with 4 packs of 8oz containers and boasts a full-bodied flavour complete with a deliciously thick crema. This ground coffee is developed from 100% Arabica sweet and aromatic beans exotically originating from South America – giving it that highly sought after authentic feel, while still conserving the rich, full coffee flavour even after removal of the caffeine ingredient. Although ideally suited to espresso-drinks, it’s also suitable for flexible use in all types of coffee makers. → Get the Lavazza Decaffeinated Coffee on Amazon! Ground and packaged while still warm from roasting and with one-way freshness valve this Eight O’Clock Original Decaf Coffee promises the freshness factor locking in that raw flavour and providing a smooth taste, complementing the calm and mellow feel, which really defines what decaf should be all about. This pack includes 6 containers of 12oz bags, so plenty of quality coffee to keep you going and at a cheaper price than many of its competitors on the market! → Get the Eight O’Clock The Original Decaf on Amazon! Boasting a delightfully rich and full-bodied flavour that will leave you astounded that it’s actually decaf! Promising the taste of Europe in every cup, this grind is produced from 100% premium coffee beans originating from the world’s most renowned regions for coffee. And here’s the kicker – the extra fine grind means that you can make a rich cup of coffee using up to 30% less than your normal everyday grind, so you get to enjoy the quality without worrying about the quantity. → Get the Melitta Medium Roast on Amazon! With Douwe Egberts, you know you’ve got a brand you can trust for producing exceptional quality! Many have been persuaded to buy the decaf package after falling in love with the regular coffee – and then say it’s almost indistinguishable! And while the fineness of the grind may not be ideal for your machine, it would appear worth the risk! Medium roasted producing a rich, full and velvety textured taste, you’re almost guaranteed to love this product – but be warned, you may be disappointed with the coffee when eating out! → Get the Douwe Egberts Decaf Medium Roast on Amazon!